Contemporary Medical Acupuncture is a healthcare system that utilizes very fine solid needles to elicit a specific neurological response from the patient and help restore normal function. It is a modern variation of Traditional Chinese Acupuncture, and it targets specific points that are neurologically relevant to the area of dysfunction. 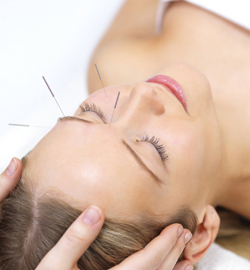 Acupuncture is comfortable, relaxing, and very effective for many common ailments. Contemporary Medical Acupuncture works to restore function using several different mechanisms at once. On a local level (at the site of injury or dysfunction), Acupuncture helps increase blood perfusion to tissue, decrease inflammation, and reduce muscle spasm. At the spinal level, the nerve signal created by the Acupuncture helps to naturally block pain from the injury. When the Acupuncture signal reaches the brain, it helps to stimulate production of serotonin, dopamine, and endorphins that reduce sympathetic tone (decrease the stress response) and create a relaxed state that is conducive to healing. This approach to Acupuncture uses various inputs that treat the dysfunction via different neurological pathways. This multi-faceted system often results in a more rapid and complete recovery than other treatments. Common conditions that may respond well to Acupuncture include: headaches, migraines, shoulder pain, arthritis, carpal tunnel syndrome, tendonitis, tennis elbow, rotator cuff dysfunction, fibromyalgia, frozen shoulder, TMJ dysfunction, depression, anxiety, stress, neck pain, muscle spasms, abdominal pain, low back pain, sciatica, hip pain, knee pain, plantar fasciitis, foot pain, ankle pain, numbness, tingling, PTSD (post-traumatic stress disorder), tooth pain after dental procedures, overactive bladder, constipation, diarrhea, hot flashes, pelvic pain, adrenal fatigue, muscle weakness, sinusitis, smoking addiction, overeating/ weight management, post-surgical pain, chemotherapy side effects and many more. Often Acupuncture can help when other treatments have already been exhausted. Acupuncture can even be utilized as a maintenance therapy to help restore energy and promote relaxation in an otherwise healthy person. Let us know if you think you may benefit from this centuries-old treatment.